Especially in Europe, most pilots participate in hot air airship competitions which are conducted according to the BX Uniform Model Rules issued by the FAI Ballooning Comission. Because the hot airship community is relatively small, sanctioned events have so far been limited to World and European Championships. The advantage of the rarity of airships is that most pilots know each other, and newer pilots can compete at an international level in relatively short time. The 1st Hot Air Airship World Championship was held in 1988 in Luxembourg. About twenty teams from as far as China attended the highly successful event. European Hot Air Airship Championships were held in 1989 and 1991 but I believe they were abandoned in later years so as not to interfere with Worlds. Since then, the cities of Nottingham (England, 1990), Besançon (France, 1992), Château d'OEx (Switzerland, 1994), and Aosta (Italy, 1996) have hosted the biennial World Championship. 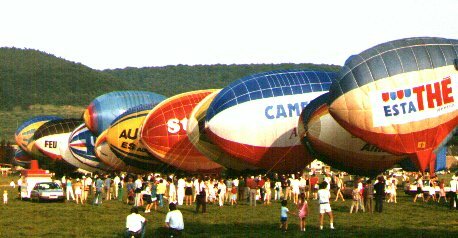 The 6th World Hot Air Airship Championship will be held in Gatineau (near Ottawa, Canada) from September 2 to 7, 1998. In the last ten years, the popularity of hot air airships has slowly increased, mostly in continental Europe and England. Besides the World and European Championships, more regional and informal competitions and gatherings have been organized. Still, hot air airships are far from being a common sight and a lot of work needs to be done in order to spread their presence beyond the borders of Europe. One major step in this direction was the 1998 World Hot Air Airship Championship which took palce in Gatineau, Canada. This was first time an event for hot airships was held on the North American Continent and hopefully this fact will contribute to the popularization of sportive powered aerostation in that part of and around the world.